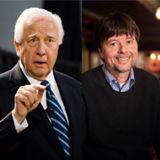 A number of distinguished American historians, led by David McCullough (Truman, John Adams) and Ken Burns (The Civil War), have started a Facebook page to oppose the candidacy of Donald Trump. While the group is conscious of the need to extend its coverage beyond the middle-aged, male cohort of the profession – it’s only been going for a week – it puts a blunt case against Trump, whom McCullough calls a ‘monstrous clown with a monstrous ego’. The Facebook page, Historians on Donald Trump, is here. In the trailer in the New York Times article, historian Ron Chernow (Alexander Hamilton) fears that Americans are about ‘to succumb to historical amnesia’ and let ‘Donald Trump or any other demagogue’ write on a blank slate of national history ‘whatever the hell he wants’. McCullough himself lists President Eisenhower’s four qualities needed for the presidency: character, ability, responsibility, experience. Trump, says McCullough, ‘fails to qualify on all four counts’. This initiative highlights the potential role of historians in the public sphere, as well as bringing into sharp focus the importance of the US presidential contest, not just for Americans but also for the rest of us. It also indicates that, in an atmosphere where people forget their past, eloquent urgers are quite capable of constructing a present and future – and, in the process, distorting history as well.